British rock star David Bowie sings "Little Wonder" on the stage of the Ariston theater in San Remo, Italian Riviera, Thursday, Feb. 20, 1997. Bowie was one of the foreign stars featured in the Italian song contest "Festival of San Remo." Legendary English rocker David Bowie is slated to release another signature, space-themed album in the coming months, but this time he's taking a decidedly jazzy turn. The 68-year-old musician will release "Blackstar," his 25th studio album, on January 8 to coincide with his 69th birthday, Variety reports. 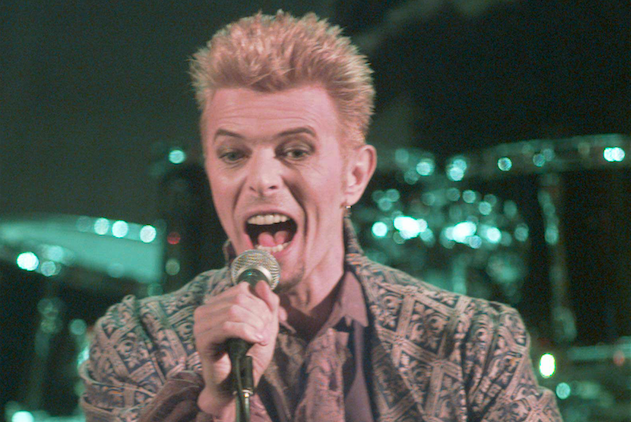 The seven-song album was reportedly recorded at Magic Shop studio in New York City, where Bowie was joined by several local jazz musicians to collaborate on what The Times calls possibly his oddest, most "bonkers" work to date. The eponymous lead single will debut November 19 and will also be featured in Bowie's upcoming musical with Enda Walsh, "Lazarus," which stars Michael C. Hall of "Dexter" and "Six Feet Under" fame. The premise for "Lazarus," based on the Walter Tevis novel "The Man Who Fell to Earth," surrounds an alien who ventures to Earth in search of water for his draught-plagued planet. According to The Times, "Blackstar" will be "an album of long, jazzy jams mixed with the kind of driving beat pioneered by Seventies German bands Can and Kraftwerk." Listeners can expect Gregorian chants, a soul section, and electronic beats to accompany Bowie's distinctive vocals. The album will be a follow-up to 2013's "The Next Day," which received largely positive reviews for its blend of styles that held true to Bowie's celestial charm.